In Episode One we heard how beautiful Princess Draupadi looked after her five Pandava husbands, and all their followers. They were living in exile in the dark and dangerous jungle. In order to help Draupadi feed everyone, Surya the Sun God, presented Yudhishthira, the eldest of the Pandavas, with a marvellous gift. It was the wondrous Bowl of Plenty, which provided delicious food for everyone, exactly as they liked it. The magic bowl kept providing food all day, until Draupadi herself had finished her evening meal, and was fully satisfied. Then the bowl would empty, and remain so until the next day. Knowing about the magic bowl, and its special properties, evil Prince Duryodhana, who hated the Pandavas, sent the holy sage Durvasa and his thousand followers, to visit the Pandavas in the jungle. He slyly arranged things so that Durvasa and his devotees would arrive after Draupadi had finished her evening meal. The Pandavas would then be unable to feed the holy man and his retinue. Sage Durvasa had a famously short temper. Duryodhana felt sure that Durvasa, hungry and insulted by the lack of hospitality, would deliver a mighty curse against the Pandavas. He was delighted with his own cunning, and waited eagerly to hear news of the outcome of his evil plan. Sage Durvasa and his thousand disciples rounded the bend of the jungle path, and there before them lay a collection of simple dwellings. It was the encampment of the Pandavas and their wife Draupadi, and all their many followers. Waiting to greet him was Prince Yudhishthira, the eldest of the five Pandavas. With him were his noble brothers, looking like handsome Gods on earth, and Draupadi, radiant with beauty and intelligence. Durvasa was pleased when they all bowed respectfully. But Yudhishthira was concerned. He knew that they had no food. The magic bowl was empty until tomorrow. Yudhishthira, trusting in the Gods to protect his wife and brothers and himself, came up with a plan. Yudhishthira, the other Pandavas, and Draupadi realised that Duryodhana had laid a cunning trap for them. At this Draupadi flinched. What hospitality could they offer? What food could she lay before Sage Durvasa and his one thousand followers? What did Yudhishthira have in mind? But she had complete faith in her husband, and waited to hear what was coming next. Thinking fast, Yudhishthira, played for time. He spread his hands in a wide gesture. Sage Durvasa and his followers, pleased with this excellent suggestion, followed one of Yudhishthira’s servants, who led them the long way round, down to the river. Sage Durvasa, and his thousand followers, delighted in the cool waters of the river, and they offered prayers to the Gods. They raised handfuls of water over their heads, and let the water stream down their face and hair. So Draupadi withdrew to her hut. She fell to her knees and prayed fervently to the Lord Shri Krishna for help. Some years before, at a gathering of powerful kings and queens, the Lord Shri Krishna was forced to deal sternly with an evil-doer. In the fight, Krishna cut his finger. Without a thought, Draupadi tore a piece from her costly sari, finely woven of thousands of threads of pure silk and fine gold, and sewn with rare gems. With her own hands she bound Krishna’s finger with the cloth. The Lord Shri Krishna dwelt in Dvaraka, a kingdom many thousands of miles away. But, in answer to Draupadi’s simple, but sincere prayer he immediately appeared, standing before her with a kindly smile on his lips. Draupadi could have wept with relief! The Lord Shri Krishna had come! Now everything would be all right. 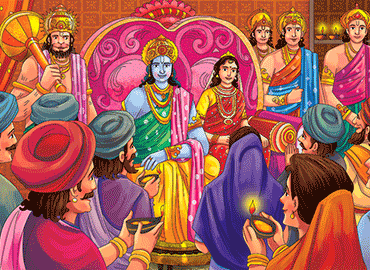 Eagerly Draupadi began to explain the trap that had been sprung on them by evil Duryodhana. She told of the empty bowl, and the arrival of Durvasa and his one thousand devotees, and the need to feed them, and how clever Yudhishthira had bought some time by sending them to the river to bathe. Draupadi patiently explained again that there was no food, and that the magic bowl was empty. Draupadi’s limitless faith in the Lord Shri Krishna was being sorely tested, but she knew in her heart that nothing could go wrong when he was there. So she moved quickly to the special place where the bowl was kept, and brought it back to him. On the lip of the bowl, almost too small to notice, was a single tiny grain of rice. Then the Lord Shri Krishna picked up the tiny grain of rice. He brought it slowly to his mouth. He ate. When Krishna’s hunger ended, all creatures who, at that moment, had felt hunger, now felt completely satisfied as well. Durvasa with his hungry disciples were down at the river enjoying their cooling dip, and looking forward to a hearty meal. Suddenly each of them felt himself to be completely full. Not one of them could have swallowed another morsel. Durvasa unable to eat another thing, was struck with fear. “If we are invited to Yudhishthira’s feast, and we refuse to eat, he will be insulted,” thought Durvasa. He turned to his disciples, who all had equally worried looks on their faces. They waited for Sage Durvasa to say something. Instead, he made his way to the bank, climbed out of the river, collected his few belongings and, followed by his one thousand devotees, stealthily slipped away. They never visited the Pandavas again. Yudhishthira’s servant watched this whole curious display in amazement. He reported to the Pandava brothers, Draupadi and the Lord Shri Krishna. Krishna was delighted to stay with his beloved friends, and they talked and laughed together about their narrow escape long into the night!